Many people who consider using the spirit board wonder, "Do Ouija boards work?" Like much in the paranormal, there's no pat answer to this; there's only speculation. The topic of whether and how Ouija boards work remains hotly debated. The Debate: Do Ouija Boards Work? Throughout its storied history, there has been debate about how the Ouija board works. There are two major schools of thought regarding whether the movement of the Oujia board planchette is really paranormal in nature. On one side, scientists believe the motion comes from a psychological artifact called ideomotor action; this is nothing more than subconscious movements of the hands by users. On the other side are spiritualists who believe that the Oujia board serves as a doorway to the spiritual realm. How Does the Ouija Board Work? There are two types of evidence relating to the Ouija board. The first is anecdotal evidence, which comes from the stories people share and from their experiences. This type of evidence is not quantifiable and doesn't adhere to scientific method. The other type of evidence is scientific; that is, it was gathered under controlled circumstances in order to test a hypothesis. Across the internet, you can find fascinating accounts of real experiences people claim to have had while using the Ouija board. And while these stories are interesting, what they amount to is anecdotal evidence; that is, evidence gathered outside of any scientific method and only through personal accounts of things people report have happened. The prevailing theory of how the Ouija board works has nothing to do with spirits. Instead, it's buried deep in the psychology of players, who agree to suspend belief while they work with the board. With the agreement of players the board "works" to communicate with spirits, individual and group psychology kicks in and the players then, without realizing they are doing so, experience almost imperceptible muscle movements that guide the lightweight planchette, according to Psychology Today. This makes a certain sort of sense given how the planchette is designed to glide lightly and easily along the board's smooth surface. J.B. Rhine, famous for his research into psychic functioning, and his wife, Louisa, studied many of the occult tools of the day including the Ouija board. Louisa, a respected researcher within psychical research circles, wrote an article in a 1970 newsletter for the American Society for Psychical Research on the subject of Ouija boards. In this article, Louisa noted the messages from the Ouija board appeared to come from the person's subconscious. She reported the fact the user wasn't even aware of his or her own subconscious personality, and the strange responses from the board created the illusion the person was dealing with another intelligence entirely. 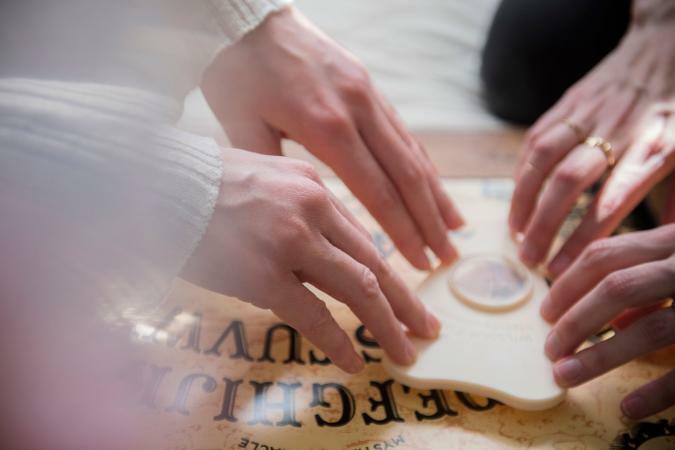 Many psychics point out the fact that since psychic functioning seems to originate from a person's subconscious, that may explain why psychics find that the Ouija board helps them amplify those psychic abilities. In a fascinating formative evaluation conducted by researchers Joyce Ma and Debbie Kim funded by a grant from the National Science Foundation, the researchers set up an air-hockey style "talking board" display as an exhibit at a science museum. After visitors utilized the exhibit, researchers questioned them for a reaction to the device. They found the following. Ten (of 19) of the visitors reported the device didn't work. Two of the visitors reported results it provided legitimate answers to questions. The remaining visitors were not using the device to answer questions. Sixteen of the visitors reported that they didn't feel "uncomfortable" using the device. Two visitors felt very uncomfortable because it reminded them of the Ouija board. One group of young kids were so disturbed by the exhibit that they refused to be interviewed. A 2018 study conducted by a post-doctoral researcher at Aarhus University showed participants playing the Ouija board demonstrated eye movements that predicted where the planchette would go once they started to recognize a pattern in its movement. The study authors concluded this meant people playing the Ouija board subconsciously sought to make order in recognizable patterns, which suggests they may have played a role in the planchette's movement regardless of the fact they were unaware they were doing so. What existing research shows is that the Ouija board may work on different levels. Psychologically, just the presence of a Ouija board can scare people. Additionally, at least a small percentage of people experience substantial enough results it often scares them from ever using it again. Still other people overlook the cultural stigma and utilize the board for psychic, religious, or entertainment reasons. What research has proven is that the human factor needs to be present for the board to move; it cannot move on its own, and it can't work when the user is blindfolded. However, the ultimate source of the information that comes from the board still remains an intriguing mystery.